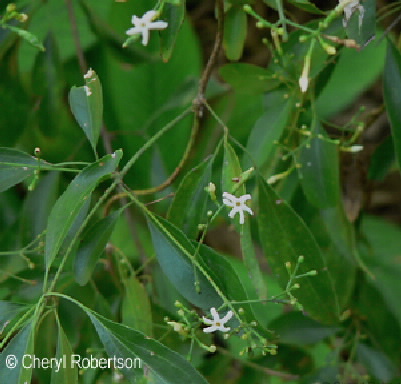 Growing in the cluster of plants at the base of the Dallachy’s Gum to the left of the walkway from DA2 to DA5 is a native jasmine. This vine has delicate strongly perfumed white flowers about 1 cm diameter, these flowers are followed globular, black fleshy fruit. Most of the leaves have 3 leaflets. Flowering in spring. Quite a common plant in the bush.